Somali soldiers and one civilian were killed on Friday in an attack by Shebab militants on a military checkpoint in Baidoa and in a car bombing in the capital Mogadishu, officials said. A Somali military official, Colonel Mohamed Hassan, said six soldiers died when the Shebab, Al-Qaeda’s main African affiliate, carried out a pre-dawn raid against their post near Baidoa, some 250 kilometres (155 miles) northwest of Mogadishu. 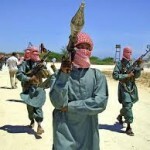 “The Shebab fighters attacked three locations including the checkpoint outside Baidoa. Three of their fighters were killed,” said Suleyman Abdulahi, another local official. In another incident, a civilian was killed and two other wounded in a car bombing blamed on the Shebab, who are fighting to topple Somalia’s internationally-backed government. “They attached a car bomb to the civilian’s car. The civilian was killed and two others wounded,” interior ministry spokesman Mohamed Yusuf told reporters. The attacks came at the end of a week which saw the United States conduct another air strike against the group. The Somali government said the Shebab’s intelligence chief, Abdishakur Tahlil, was killed in Monday night’s raid. The Shebab’s former leader Ahmed Abdi Godane was also killed by a US air strike in September.